Just a quick post today I'm afraid. 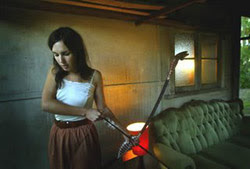 Holly Throsby, my latest high rotation joy. Her 2006 album Under The Town is just full emotional highs and lows and huge creativity. Her vocals are so incredibly delicate, everything about her sends shivers down my spine. She's plain adorable and her music fits with her so well. Having recently wowed crowds at the Laneway Festivals last month she will soon be rising up the ranks.